Extra shelf on each side. 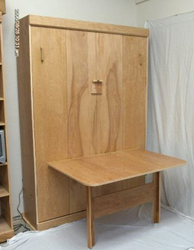 You are bidding on a Birch or Oak Side Panel bed with SOFT CLOSE GAS SPRINGS. This is absolutely the very best do-it yourself kit on or off the internet at this time. This is a high quality cabinet hand crafted and sanded smooth. It comes with a simple mechanism that has been thoroughly tested and is guaranteed to be strong, sturdy and superior to all the other mechanisms. There are two types of Murphy Bed cabinets on the market today; the bi fold door type and the panel type.The bi fold door type sells generally for less and has a metal frame exclusive of the cabinet that has to be bolted to the ground. The bi fold door over time goes out of alignment and needs to be constantly adjusted, due to the weight the hinges need to carry.The Panel bed is more of a piece of furniture that can be moved around in the house after it is assembled. It is attached at the top with three 3 1/2 inch screws, however it is very important that these screws enter the studs.The front of the panel bed becomes the doors and fold down with the mattress on it. This panel bed has no mechanical springs and no flopping doors,we install two bullet latches in the upper top corners of the panel bed to lock and snap the bed in place when it is closed. We also install a four inch wood handle to the upper right and left corners of the bed face, this is an inconspicuous place yet very functional. We etch the front face so it appears to be four separate doors. We also add a 3/4 inch x 3 1/4 inch x 45 inch trim board on the bottom and top of the front of the cabinet, this really makes the cabinet look great. I have been building and installing Murphy Beds for over 10 years and as far as I am concerned this is the best system and style on the market today. We make it out of 3/4 inch Birch or Oak, both look great. All edges get wood edge banding and every part is sanded with 220 grit sandpaper. The counter balance for the bed is two nitrogen gas pistons. These pistons are not subject to metal fatigue or catastrophic failier. I am offering the side beds with soft close gas springs. The pistons are held in place by metal plates and pins, this will allow you to change a piston fairly easy if that should become necessary. I have been told by engineers that these pistons should last 20 years with daily use. All the metal parts are powder coated steel black.. Metal plates are thru bolted to the bed frame and the side panels with furniture grade antique brass finish bolts(flat head). The hinge is a 5/8 inch metal rod on a metal plate that is bolted and screwed to the bed frame and side panel.I have added to these units a 5/8 inch collar that goes between the bed frame and the side panel, this becomes a one time adjustment so the pressure from the piston against the side panel can't draw the side panel into the bed frame. This allows you to maintain a 3/16 inch exposure between the bed doors and the side panel. This overall system has been on the market for at least 15 years in many different forms. My system is an overall improvement of these other systems. Some of the wood parts are numbered and are pre drilled. The 1x2 supports that become the bed frame need to be countersunk by the installer. There are a few supplies that will be needed: a battery operated screw gun, 6 inch #2 square driver, countersink, 7/16 inch wrench,Allen wrenches, tight bond glue. Liquid nails, clamps and a stud finder. All of these items can be purchased from a local hardware store.We include a pictorial assembly and installation manual that is very comprehensive,plus you can call for personal attention if you are having difficulties.All wood parts are held together by wide thread pocket screws, it is very easy to assemble if the instructions are followed in sequence. The size of this bed is 85 inches wide by 60 inches high by 16 inches deep.This bed will hold up to a 9 inch deep mattress. The bed folds out into the room 43 inches. The total weight of the bed is 189 pounds. This is one of the most useful products you will ever own, it saves space and that's money.We at Bergman Woodworkers offer a unconditional guarantee, if you are not satisfied with our product within seven days pay the shipping and we will give you your money back. The shipping cost is set at $165.00 ground in the contiguous United States.. There are three boxes of about 70 lbs per box, Please call 505-4243634 if you have any questions. Now offering in maple and oak. Birch works best for painting, also we use the higher quality all American birch plywood.. I also offer an floating headboard for $125.00 this allows you to sit up in bed with a backrest. Dan@ 505-286-0856 or cell 505-470-8902 Add on prices change over time. 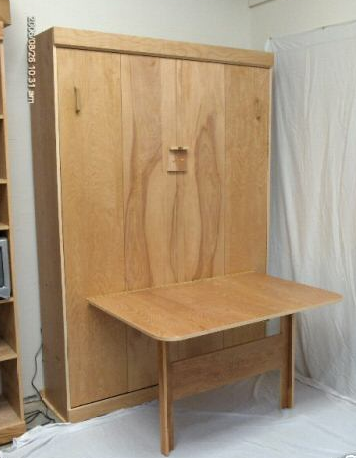 This is the only do-it yourself table bed on the market at this time. The mattress is not included .It is built out of 3/4 inch Birch Plywood and clear poplar for the interior ribs. With twelve years in the Murphy bed business I have taken the best ideas off the net and from the company's I have worked for and came up with this bed. Today I have designed a simple addition, a table. If you have a tight small room that does not have room for a table and a bed this is for you. I have sold custom made sizes in the past but this one is made for simple installation. This is a high quality cabinet, hand crafted and sanded smooth. It comes with a simple mechanism that has been thoroughly tested and is guaranteed to be strong sturdy and superior to all other mechanisms. This Panel Bed/Table is more of a piece of furniture, it can be moved around the house after it is assembled. It is attached to the wall at the top with three 3 1/2 inch screws into the stud wall. The front of the bed becomes the doors and fold down with the Mattress in it. This bed has no mechanical springs or flopping doors. It has two bullet latches in the upper right and left of the door to lock and snap the bed in place when it is closed.there is a constant pressure allowed to keep the cabinet door shut It has a 4 inch handle in the upper right and left of the door face, this is inconspicuous place yet very functional. The added weight of 18 pounds from the table does not adversely affect the up and down resistance. 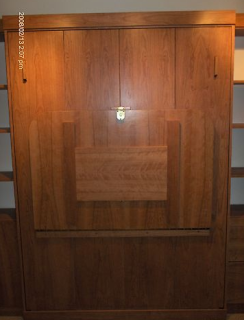 We etch the front doors so it appears to be 4 separate doors.We also add a 3/4 inches 3 1/4 inch trim board on the bottom and top of the cabinet, this really makes the cabinet look great, most of the competition leave this out.All exposed edges are edge banded with real wood and sanded smooth.with 220 grit sandpaper. The counter balance for this bed is two nitrogen gas pistons. These pistons are not subject to metal fatigue or catastrophic failure. The pistons are held in place by metal pins, this allows you to change them out easily if that should become necessary. I have been told by engineers that these pistons should last 20 years with daily use. All the metal parts are black powder coated steel.Metal plates are through bolted to the bed frame and the side panels with furniture grade antique brass finish head bolts and nuts. (Flat Head). The hinge is a 5/8 inch metal rod on a metal plate that is bolted and screwed to the bed frame and the side panel.There is a 5/8 inch adjustable collar that goes between the bed frame and the side panel. This allows you to maintain a 3/16 inch gap between the doors and the side panels. 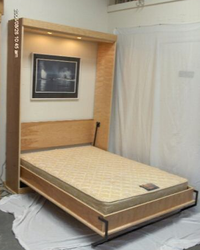 Variations of this bed have been on the market for at least fifteen years. My system is an overall improvement of these other systems. The most important distinguishing characteristic is the FLIP OVER LEG. (as seen in the pictures) . It works as a leg when the bed is down and holds all the bedding in place when the bed is in the vertical position. The third use is to shut the door and leave the leg out and it becomes a coat hanger. The leg is in three parts, two legs and one cross bar,they are bolted tightly together so they work as one unit. the flip over leg is rated to hold 1,000.00 pounds..
No finish is applied to this kit at this time,this you will have to have done or do it yourself, it is not hard if you follow the instructions or just paint it.Most people put two to three coats of water based polyurethane. For the best results I lay all the parts out on tables and a sealer coat is applied about a pint should cover. After about an hour (dries to touch in 15 minutes), it is sanded with 220 grit sandpaper with a 5 inch orbital sander.Then a second coat is applied and sanded and is you are really fussy a third coat is applied and you have a great finish.I use the Pro series for (Floors) offered at home Depot. Minwax carries a polycrylic that works great also but a little more money.The only real trick to it is laying everything flat when applying the coatings, It likes to run, and if it does just sand it out after an hour goes by and touch it up with a spray can of min wax. All of the wood parts are numbered against a packing sheet and a brief discription of where they go.The 1x2 supports that become the bed frame need to be counter- sunk by the installer. Here is a list of the supplies you will need to assemble and install the unit: Screw Gun, #2 square drive 6 inches long, set of Allen wrenches, stud finder, pliers, Phillip and regular screw drivers, liquid nails in a pint tube,Wood clamps help,level. Included is a pictorial assembly and installation manual that is very comprehensive, plus most people call in once or twice if they get stumped. I am working on a Video that may help even more. It helps if you have some mechanical background however there is no cutting or drilling required.All wood parts are held together by pocket screws, it isn't that hard to put it together if the instructions are followed in sequence. I have started to install the right and left hand metal parts on the bed compartment because that is where most people have difficulty. The size of this bed is 59 inches wide by 85 inches tall by 15 1/4 inch deep. The bed down comes out into the room 82 inches. This bed will hold up to a 10 inch mattress.The total weight of the Table-Bed in Birch is 220 lbs. 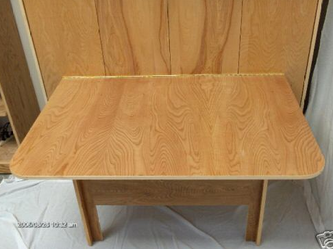 The table is made out of 3/4 inch Birch plywood with edge banding. I have a 4 inch radius so the edge banding works and due to the fact that most people that will want this need protection from sharp corners. 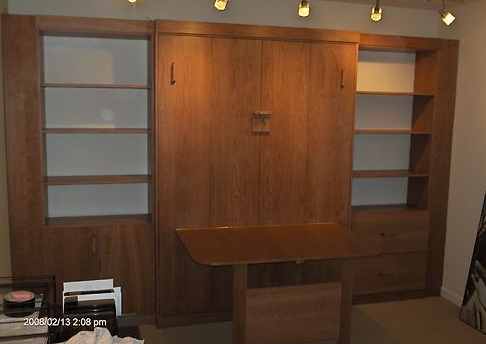 3/25/2008 I am now offering this unit in Oak for the same price as Birch. I have reworked the table with a brass secret lock on the table top and made the legs only come out 3/4 of an inch. The new lock has a brass knob to hang a picture on..